To make this broth extra spicy, use 3 Thai chilies for the broth. This recipe yields roughly 35 to 40 dumplings. Prepare the Broth: I like preparing the curry broth ahead because this gives the broth more time to develop the flavors. Heat the 1 tablespoon of oil in a pot. Add onions and cook them for 2 to 3 minutes. Next, add the minced ginger, garlic, and chilies (if using) and cook for about 30 seconds, stirring constantly. Add the red curry paste and sugar and stir to combine. Add the vegetable broth and 1 teaspoon salt, cover the pot, and bring the broth to boil. Reduce the heat to a simmer and swirl in the coconut milk. Let the broth simmer for about 10 minutes, covered. Turn off the heat and let the broth sit on the stove, covered, as you make the dumplings. Drain the tofu and wrap the tofu around a layer of paper towels. Press the tofu by placing the tofu block on a plate and weighing it down with a stack of plates. Let it sit for 15 to 20 minutes. Remove the paper towels and transfer the tofu to a bowl. Using your hands, squeeze the tofu until you get a soft mush. Set the tofu aside. Add the vegetables, chopped basil, and soy sauce to the bowl with the tofu. Stir to combine all the ingredients. Taste to see if the filling has been seasoned to your liking. Get your dumpling-making station set up. Take the wrappers out of the packaging. Have a small bowl filled with water, a large baking sheet, and 2 kitchen or linen towels ready. The wrappers and the dumplings dry out pretty quickly. Use one towel to cover the wrappers and another large towel to cover the finished dumplings. Dip a finger into the bowl of water and wet 2 adjacent sides of the dumpling wrappers. Spoon about 2 teaspoons to 1 tablespoon of filling into the center of the wrapper. If you can fit more filling into the dumpling, great! Seal the wrapper on the diagonal (dry sides over the wet sides) so that you end up with a triangle shape. Press down on the sides to get rid of any air pockets and to make sure that the dumpling is sealed. You don’t want the filling to release while they’re cooking. Lightly wet one of the base corners of the folded triangle, and fold the dumpling in half so that the other base corner overlaps the wet corner. Repeat until you have all the dumplings filled. If you need a visual, refer to the photos above or watch this video for my folding technique. Bring the red curry broth to a simmer again. Turn off the heat and add the zucchini noodles. The noodles should soften in several minutes. Bring a big pot of water to boil. Add about half of the dumplings into the boiling water and cook for 3 to 4 minutes. All the dumplings should float to the top. 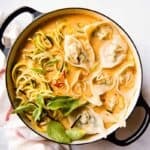 Transfer the cooked dumplings to the pot with the red curry broth. Cook the remaining dumplings or freeze them. Serve the dumplings and zucchini noodles into bowls. Ladle some broth over the dumplings and noodles. Garnish with sliced scallions and more Thai basil, if desired. *Note about the broth: I like a ton of broth in my wonton soup, so I usually use 6 cups of broth for this (and add a bit more salt and adjust the other seasonings as needed). Feel free to play around with the recipe. **Note about the Thai basil: You can use regular basil for this as well. If you don’t have basil, adding more chopped scallions and any other herbs (such as cilantro or chives) will work too.